In short, S Pen remote control allows you to perform operations in some apps without looking at the phone screen (the S Pen nib does not touch or hover over the screen). It is just like the TV remote for your TV. How to enable and disable S Pen remote control on Galaxy Note 9? 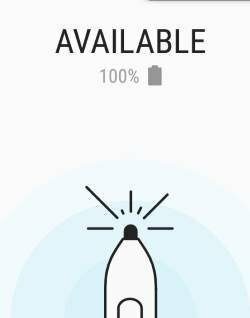 By default, S Pen remote control on Galaxy Note 9 was disabled. You need to enable it if you want to use the S Pen remote control. You can enable S Pen remote control in Settings —Advanced features. As shown in the screenshot below, you can tap S Pen in the Advanced features page. Now, in the S Pen settings page, as shown above, tap S Pen remote. In the S Pen remote settings page, as shown below, you can tap the On/off switch (marked as 2) to turn on or turn off S Pen remote control on Galaxy Note 9. How to customize S Pen remote control on Galaxy Note 9? 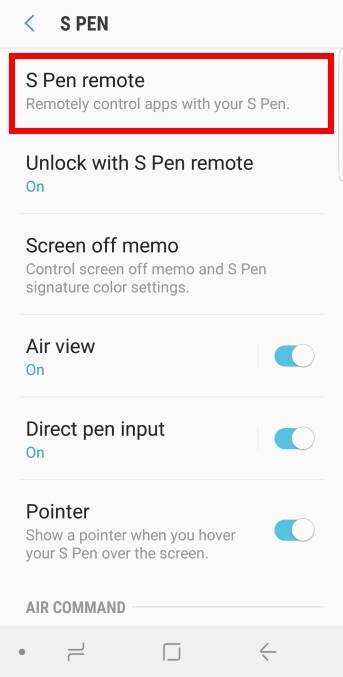 Samsung allows you to customize S Pen remote control features on Galaxy Note 9, as shown in the S Pen remote settings page shown above. When you are on Galaxy Note 9 home screen, if you press the S Pen button once, you can open an app or open an S Pen feature. By default, the camera app is assigned. It means the camera app will open if you press the S Pen button once. If you press the S Pen button again, a picture will be taken by default. You can use any app installed on the phone to customize this feature. Of course, you can only choose one app. If you want, you can assign an S Pen feature, instead of an app, for this operation. For example, you can choose one of the following S Pen features: create a note, smart select, screen write, live message, Bixby vision, translate, magnify, glance, view all notes, PENUP and colouring. If you press the S Pen button once (single press). If you press the S Pen button twice (double press). For each app, you can customize the actions. You can also turn on or off app actions individually. The numbers in this section correspond to the number in the screenshot shown above. You can choose to turn on/off S Pen remote control for this app (4). To customize the app actions for the single press, you need to tap single press field (marked as 5 in the screenshot shown above). Available actions will pop-up, and you can select one. Similarly, you can customize the camera app action for the double press. It is allowed to choose the same action for the single press and double press. You can tap the switch (7) to turn on/off the S Pen remote for the Gallery app. You can customize the Gallery app actions as mentioned above. Please note, S Pen remote control does not work on third-party gallery apps. In most regions, the Samsung voice recorder app was not pre-installed. You can get it in Galaxy Apps. If you need a voice recorder on Galaxy Note 9, this app is actually better (and free) than many other paid apps. You can turn on or turn off S Pen remote control for the voice recorder app using the switch (10). If you are using any third-party voice recorder app, the S Pen remote control will not work. S Pen remote control supports Google Chrome browser. You can turn on or turn off this support by tapping the switch (13). When you are browsing a webpage, you can use the S Pen to control the navigation remotely. Surprisingly, Samsung’s native browser (Internet) does not support S Pen remote. Samsung Clock app also supports S Pen remote control. You can press the S Pen button to start a stopwatch. If the stopwatch has started, it will mark the laps. Hancom office suite is the best alternative for Microsoft Office on Galaxy Note 9 if you use Samsung DeX for file editing. Microsoft office is NOT free when in Samsung DeX mode. So, Samsung gives you the Hancom Office as a free alternative. When you are using Hancom Show (corresponding to PowerPoint in Microsoft Office) for a presentation (screen mirroring, screencasting or DeX mode), you can use the S Pen as a wireless presenter. Next (move to the next slide). Of course, you can turn on or turn off the S Pen remote control support for Hancom office (16). S Pen remote control also supports the Microsoft PowerPoint app on Galaxy Note 9. You can enable or disable the S Pen remote support (19). The available app actions are similar to those for Hancom Show mentioned earlier. How to use S Pen remote control on Galaxy Note 9 for third-party apps? Besides the pre-installed apps, Galaxy Note 9 allows you to use S Pen remote control for all third-party camera apps and media player apps. 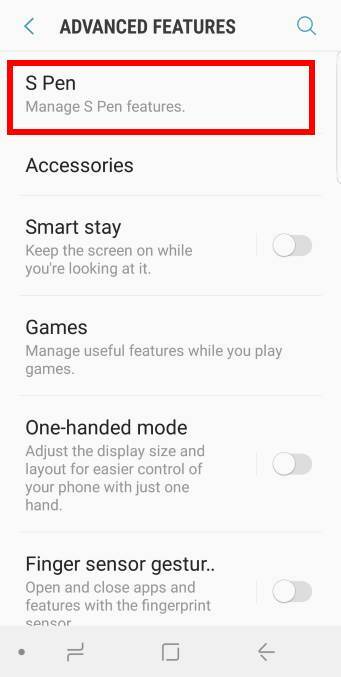 You can turn on this features in the S Pen remote settings page. As shown in the screenshot above, you can find a section named Master controls. You can turn on or turn off the S Pen camera remote by tapping the switch (22). For third-party camera apps, you can only define app action (23) for the single press. And you can only choose from taking a photo or doing nothing when pressing the S Pen button. Please note, the settings do NOT affect Samsung camera app. They apply to third-party camera apps only. In addition to the S Pen camera remote, you can also enable or disable S Pen music controls (24). Although “music control” is used, it actually refers to both music and videos. Please note, S Pen music controls apply to ALL media apps including those from Samsung (e.g., Samsung Music and Samsung Video). If you turn off S Pen music controls (24), then you cannot use S Pen to control media playing at all. Also, if you play a video in the Gallery app, the app actions (single press or double press) will follow Gallery app action settings, not S Pen music controls. Can you use S Pen remote control on Galaxy Note 9? If you have any questions on S Pen remote control on Galaxy Note 9, please let us know in the comment box below. The community will help you find the answer.